Gazelle bikes have been designing and manufacturing bikes for over a century, ranging from trekking bikes to city bikes and more recently, e-bikes. We're going to be taking a closer look at the brand and the bikes they produce to find out what makes Gazelle bikes stick out from the many other manufacturers. Gazelle, or Royal Dutch Gazelle to give them their full name, started in 1892 as a two-man company producing three different bicycles and has now developed into the largest Dutch bicycle brand selling over 250,000 bicycles a year. All Gazelle bikes are still assembled in their factory in Dieren and in 2015, Gazelle opened their brand new factory, right next to the original building. In 2018, Gazelle celebrated their 15-millionth bike being built. The front of the new factory is floor to ceiling glass so you can walk past and see their mechanics making the bikes! Sustainability is at the forefront of the Gazelle business plan, Gazelle are constantly seeking new opportunities to improve sustainability and reduce their impact on the environment. 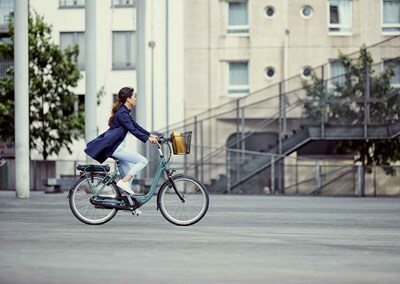 Alongside continual employee development and increasing employee satisfaction, Gazelle also work with cycling safety groups to prevent the number of accidents on the roads. Find out more about the history and corporate social responsibility of Gazelle here. What can you expect from Gazelle? Gazelle's bikes are designed with comfort in mind, but also functionality. Their Cabby bikes are built to carry two children or all of your shopping, perfect for any parent, the CityZen bike provides a powerful motor to give you that extra push when commuting or riding through town. Gazelle aim to make cycling fun for everyone, this is through designing and producing high quality, light bikes with smart, technical innovations. Gazelle produce a wide range of bikes for differing purposes, we've picked a select few to show you their extensive range. The Gazelle Cabby is constructed from sturdy steel, creating a bike that will truly last a lifetime. The frame itself has been carefully designed to not only carry the weight of your children and shopping, but to also be comfortable when riding. The front box is multi-function, from carry children safely, to carrying work equipment, or shopping. The HeavyDutyNL from Gazelle is the best-equipped Cargo Bike within their range. Featuring an aluminium frame and sturdy Steel rigid fork, the bike is built for any situation. Complete with front and rear carry racks, you have all the storage space required for long-distance journeys. Despite its sturdy construction, the Gazelle HeavyDutyNL multifunctional cargo bike pedals and steers with little effort. Its obvious that a lot of thought has gone into keeping the sleek aesthetic of a city commuter whilst implementing the electric bike components. The battery has been very neatly concealed within the frames lower tube, the result being a sleek looks but also sturdy and robust. With a focus on sleek design and ease of use, Gazelle's Cityzen is the perfect commuter.